Thanks to our good friend Scarlett for getting in touch about her favourite brand of gardening gloves. It’s funny as one of the light pair I got last week (part of a two part set) fell into the bucket of comfrey liquid yesterday rendering them useless! Great eh, they didn’t even last seven days! 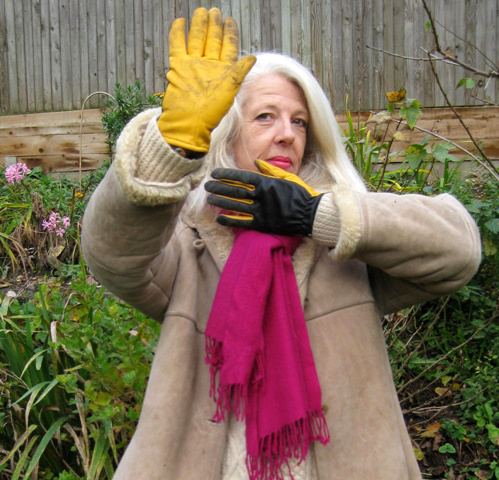 Here’s Scarlett’s nomination for favourite gardening glove, the dry touch by gold leaf. 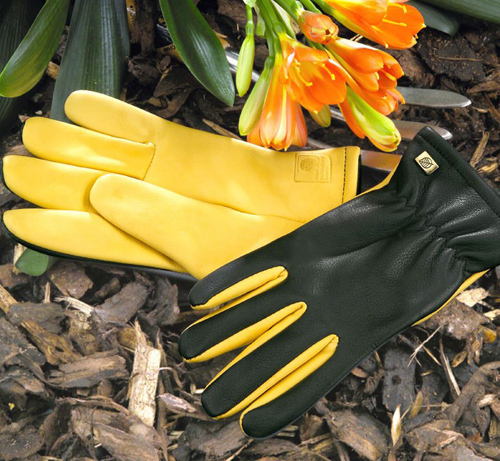 I’ve just checked amazon and it says that they are widely recognised as “The World’s Finest Gardening Gloves.” These are a classy pair of gloves unlike mine that are now hanging up to dry to get rid of that putrid comfrey water smell! Dry Touch by Gold Leaf – my favourites so far in my life. Made from the same quality leather as fashion gloves and lined, they are super comfy and long lasting, and they look fabulous too. A pair of gardening gloves lasts me about a year. I bought these Gold Leaf gloves in November 2012. They’re starting to go a bit now on one of the fingers so will probably need replacing at the end of the year, by which time they will have lasted me two years! A bit more expensive at around £20 but regular gloves cost £10-£15 for a decent pair, so these are worth the extra. Here I am vogue-ing on Magic Plot 7 when they were clean and new. I still use Gloves in a Bottle when doing small jobs like seed sowing, light pruning and cutting. A fab product! Have a look at Scarlett’s great gardening blog here. This entry was posted in Jazz Gardening and tagged Dry Touch by Gold Leaf, gardening glove of the month, Gloves in a bottle by onedeckpete. Bookmark the permalink.